Xenophobia goes against all that has been done in this country to create a kind and caring society built on the values of ubuntu. These attacks are not in line with the values of our people. We must remember that many people from other African countries have helped us to fight apartheid. They are as human as we are and deserve to be treated with respect and dignity. An injury to one, is an injury to all, President Mbeki said. It is important to know that while the xenophobic violence was serious, it was limited to only a few areas in the country. In these areas, only small numbers of people committed the violent acts. 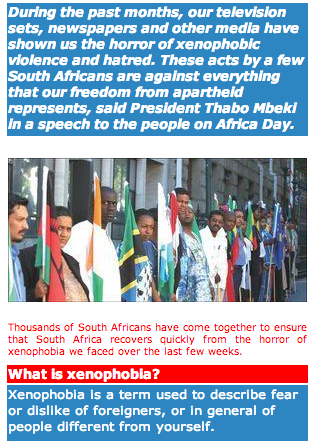 Most South Africans are against xenophobia and reacted with horror to the attacks. As soon as the violence started, South African security agencies moved quickly to bring the violence to an end. Government also acted against the violence with the help of the South African National Defence Force. In addition, they started helping victims with basic needs, in partnership with different civil society groups. 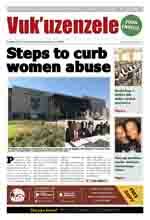 Task teams have also been set up to organise support for victims of the violence. Many South Africans all over the country are willing to fight xenophobia and have shown their support for the victims in different ways. People from all races are reaching out to them by giving blankets, food, clothing, money and shelter. Some have organised marches to show their support. Big businesses are also showing their support by donating money to help victims. Government continues to work with international organisations like the United Nations, Doctors without Borders and some local non-government organisations. They help to ensure that temporary shelters set up for victims are in line with international standards. Many of those who caused hurt to foreigners at the time were arrested and special courts set up to deal with them. South Africa values the contributions that foreigners make to grow and develop our country.